3 Ways Self-Dumping Tilt Hoppers Save Money | Hambicki's Truck & Container Sales Inc. Imagine that you are building a house and need to clean up the construciton debris spread all over the construction site and dump it into a larger roll-off dumpster to be hauled away. You quickly fill up a front loader container, but realize you have no way of getting the debris out of the front load container into the big roll-off dumpster. Eventhough the front load container has fork pockets on the bottom, your forklift doesn’t have rotating forks to turn the container up-side-down to dump the debris. The Purchasing Department wanted to save money by not adding rotating forks for an extra $2500. So what are you to do? How can you avoid risking hurting yourself throwing every piece of trash over the 8 foot sides of the container? It’s just not practical! The answer is to use a self-dumping tilt hopper to load the debris and easily dump into the larger Roll-Off Container simply by lifting the container over the Roll-Off dumpster with a forklift and pulling the quick-release rope to dump contents into the Roll-Off Dumpster. 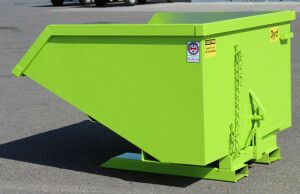 Hambicki’s sells Self-Dumping Tilt Hopper Container is 1YD – 4YD sizes. © 2017 Hambicki's Truck & Container Sales Inc.